It always amazes me when I look at a photograph of any salmon I've played a part in the capture of and how easy it is to replay almost the entire fight in my head without the assistance of Youtube! This was one such perfect Spring salmon from the Tay which was caught during the month of May. There is a learning curve required to be able to go to any salmon beat and quickly work out exactly where and when the best chances of salmon cooperation lie. As a professional salmon guide and former head ghillie on the River Tay I was fortunate to have the time to focus on these delicate often unseen aspects of the pursuit and become highly efficient in all Tay salmon fishing tactical approaches and learn exactly where to locate salmon. When guiding for guests the objective was always to teach quickly and effectively enough for the guest to be able to cast well, move properly through a pool & hook a salmon on their own without any ghillie/guide assistance. As a professional guide this would create the biggest sense of satisfaction and on many occasions this would happen on day one of a guest's salmon fishing introduction which for those of you who've been in the game long enough will know is good going. On other occasions if the salmon were not behaving some professional guide assistance would be required to save the day! I recall many such incidents where guests managed the entire task themselves and also where help was needed but one particular day comes to mind on the River Tay when after a guest had landed his third Autumn salmon that I'd hooked while fishing down behind him he turned to me and asked what he was doing wrong! The reality of the situation was he was doing everything right but the salmon were just sitting further out and deeper than anyone could be able to effectively cover on day one of their salmon fishing introduction and only a longer, deeper and better controlled salmon fly was working. However by 5pm the guest had become a true master with the skills involved in successfully playing salmon! Once a new salmon fishing guest had mastered the basics of how to use a salmon rod and fish through a salmon pool I'd always be watching the river as well as keeping a close eye on the guest. Salmon often make the mistake of showing their exact holding positions that I'd always take a riverbank marker against. 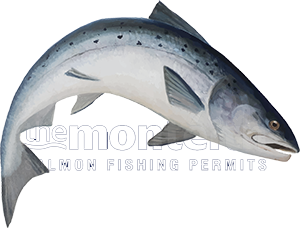 Once you know where a salmon is positioned in any pool it only requires a dozen or so casts to see if its a 'cooperator' or not which can easily make you look a lot better than you are if the location of that fish was not seen by others! The perfect Spring salmon in this shot was hooked, played & landed by one of my great Austrian client's who comes every year to Scotland in pursuit of River Tay salmon. That particular morning was day one of his three day fishing trip and I knew exactly where the salmon were holding which he hooked after a correct and stealthy approach to their holding position which didn't take long after starting to fish. It took the pressure off me as his guide for him to catch such a perfect fish at the very start of his fishing trip. In this business there's no real way to short circuit the learning curve involved other than acquiring good old long term riverbank experience and many great guides I work with are lethal at one or sometimes 2 different tactical approaches to Scottish salmon fishing. On the Tay where many fishing approaches are allowed there are only a few of us who are free to personally guide and who are highly effective at teaching these skills or when required delivering pre-hooked salmon to guests on the fly, spin, harled, anchored up or sometimes even with the good old garden fly!